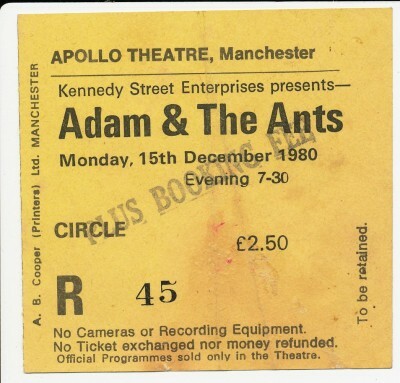 Adam and his Ants hit the big time! Went with a girlfriend and her young brother to this one just so he could see what a bona fide poppeteer looked like. I’ve still got a bootleg of him in his original incarnation before big bad uncle Malc came along and threw several spanners in his works; it all panned out nicely in the end though, at least for a while. Always loved “Zerox” , often heard alongside “Shaved Women” Crass. I think Captain Sensible's line "...your an ugly old pirate and ain't I glad" from "Wot" (surprisingly funky bassline on that! ),sheds some light on what happens when certain cultish type bands invariably and innevitably cross over to the mainstream. Can't really blame 'em though....God’s Gift were the support and they were good.